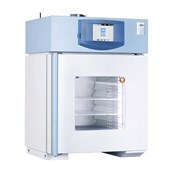 VACUCELLEVO ® vacuum drying oven is a direct heat chamber transferring heat via the patented SERVO Therm shelves. Temperature sensitive (such as solvents), easily decomposable or oxidative materials can be dried carefully in the VACUCELL® vacuum drying ovens. The unit also offers the feature to evacuate air with an inert gas. Components with hard to access spaces and contours dry quickly and effectively. 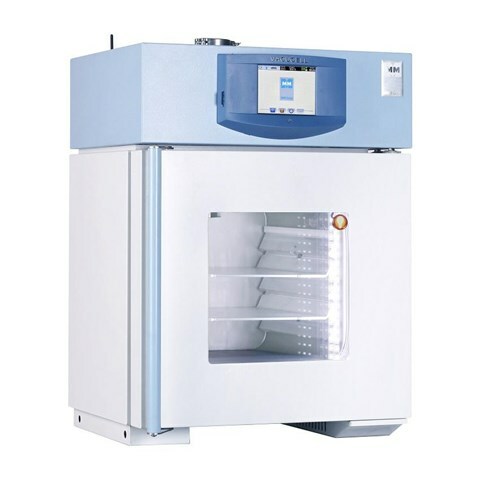 VACUCELL EVO ® ovens are ideal for drying samples to a consistent weight. Applications include use in the fields of plastics processing, pharmaceutical, chemical, electronics and other industriesA color 5.7” inch touch screen icon driven display allows for easy and intuitive control of the device, even with gloves on. Included is a 30-day integrated data logger which will automatically collect process information. The reader and SD card are supplied as a standard feature and can store data for several years. Simultaneously the various communication platforms simplifies exchanging and storing data from one device to another. There is also data output from RS 232, USB-host for external memory connection as well as a USB-device for a thermal printer or even a standard office printer. Another exceptional feature is connectivity via Ethernet interface (RJ 45 or WiFi) on the users’ network. Using a private IP address identification for the EVO unit also offers remote data collection or remote diagnostics from a BMT authorized service center. To provide the highest standards of performance, the EVO line has undergone long-term development and testing in preparation for the most demanding conditions "
There are no threads in BMT USA Vacucell EVO Reviews at this time.